Once the kidneys (the body’s filter) have become damaged, different electrolytes and nutrients are either wasted through loss in the urine, or kept in the body at levels that are too high. This leads to a variety of symptoms. The most common sign of kidney failure is an animal which starts drinking more water than usual and urinating more often. Other signs of kidney problems in animals include weight loss and dehydration, vomiting, decreased appetite and lethargy or depression. Animals with kidney problems often have bad breath and can have ulcers in the mouth or the stomach. They may drink more or less water than usual, and urinate frequently, sometimes with discomfort. They often urinate in unusual places, and the urine may appear bloody or cloudy or have a strong smell. Animals can also develop a low red blood cell count (become anaemic) if the kidneys are no longer producing sufficient amounts of the hormone necessary for red blood cell production. Not all animals display all symptoms, but as the condition progresses the overall health of the animal will deteriorate. For this reason, monitoring your pet’s behaviour closely and visiting your vet timeously, is helpful in making an early diagnosis. Kidney failure can be divided into two categories – acute and chronic. The acute form occurs suddenly and the affected animal deteriorates quickly. The sudden failure of kidneys can be due to consumption of toxins. These can include things like ethylene glycol (antifreeze), certain medications, raisins or grapes, lilies and raw onions amongst others. It can also occur due to shock like major trauma and compromised blood supply to the kidney; or because of a blockage or rupture in the urinary system. Acute kidney failure is seen more frequently in young animals than the chronic form. Chronic kidney failure has a slower and more subtle progression. It is a common condition seen in older cats. Chronic kidney failure occurs due to cumulative damage to the kidneys which can include toxin exposure, infections or long-term inflammation. There is also a genetic component to the condition, with Persians and Abyssinians being very prone to kidney failure. Chronic kidney failure is irreversible, and treatment is aimed at slowing the progression of the disease and improving quality of life. Diagnosis of kidney disease is mainly done with the help of blood tests and analysis of the urine. The blood tests screen for the accumulation of toxins in the blood. The urine tests check the concentrating ability of the kidneys as well as abnormalities in the composition of the urine; and for abnormal cells or bacteria. It is sometimes necessary to perform further tests, such as ultrasound imaging of the kidney, or taking a biopsy, to check for cancer or other abnormalities. 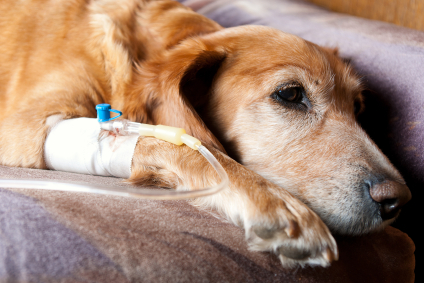 Animals with kidney failure need to be hospitalised for fluid therapy. This re-hydrates the animals and helps to flush out toxins that have accumulated in the blood. They also need to be fed a veterinary prescription diet. These diets contain optimal levels of protein to take pressure off the kidneys, without being so low that muscles are broken down to compensate. The diets are also low in salt, which is important because the filter action is compromised. As important as the veterinary diets are, if the animal is very reluctant to eat it is preferable to tempt it with any treat rather than trying to enforce the special diet and make the animal starve in the process. It is of paramount importance that the affected animal has access to fresh water at all times. Dehydration can dramatically worsen the condition. Many animals with kidney failure require medication to lower blood pressure. Some animals need medication to help with nausea, and others drugs to help reduce ulceration of the gut, or to restore pH balance, or to correct low red blood cell count. There is no fixed recipe for success and your veterinarian will supply the correct medication according to the needs of the individual animal. Animals with kidney failure must return to the vet for check-ups on a regular basis. It may be necessary for intravenous fluid therapy to be repeated, or it can be carried out at home if owners are prepared to administer fluids under the skin. As mentioned before, there is no cure for kidney failure so treatment is aimed at slowing down its progression and improving quality of life for the animal. Prognosis is worse for dogs than for cats, because in general they do not respond as well to treatment as their feline counterparts. Some cats respond very well to therapy and can be maintained on treatment for years, while others deteriorate within weeks. The earlier the condition is diagnosed, the better the prognosis, so it is important to monitor your pet for signs of ill health and make a trip to the veterinarian if you are suspicious of kidney problems.